Eladl’s blistering caricatures have landed her in hot water with some of Egypt’s powerful fundamentalists. She now has the distinction of being the first cartoonist in Egypt to face blasphemy charges. In 2012 Salafi lawyer Khaled El-Masry, Secretary General of a group called National Center for Defense of Freedoms, filed a complaint against her for defaming religious prophets. 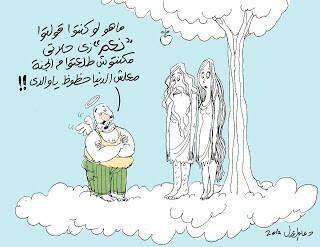 The cartoon he objected to shows an Egyptian man with angel wings lecturing Adam and Eve. The man is telling Adam and Eve that they would never have been expelled from heaven if they had simply voted in favor of the Brotherhood’s draft constitution in the recent Egyptian referendum. The court has not yet heard the case. If the fundamentalists are upset about her irreverent depictions of religious figures, one has to wonder if they have seen her searing drawings about women’s rights—and wrongs. 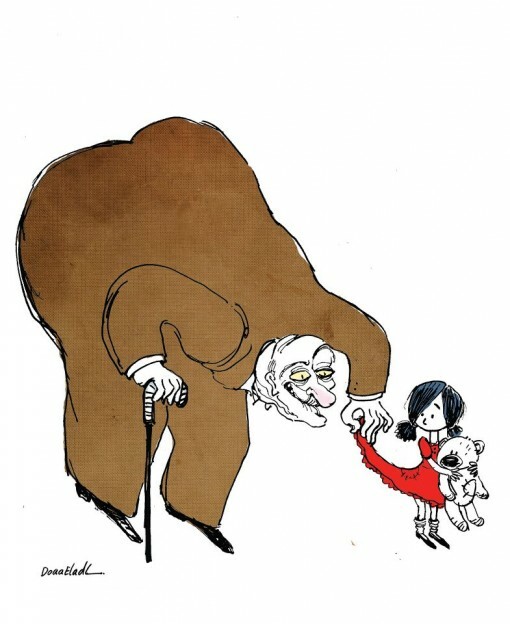 One cartoon against child marriage shows a lecherous, old man with a cane peering greedily up the skirt of a little girl holding a teddy bear. 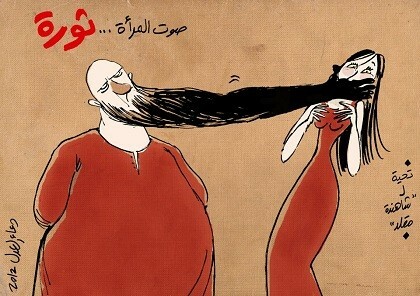 Another has the streaming beard of a fundamentalist flowing across a woman’s mouth to silence her. Eladli uses her art to bring attention to domestic violence, underage marriage, sexual harassment, violence against women, and the new phenomenon of attacks against female demonstrators. Some accuse of her being sacrilegious, claiming that her work is too shocking. The accusations don’t seem to phase her, and they certainly haven’t influenced her style. 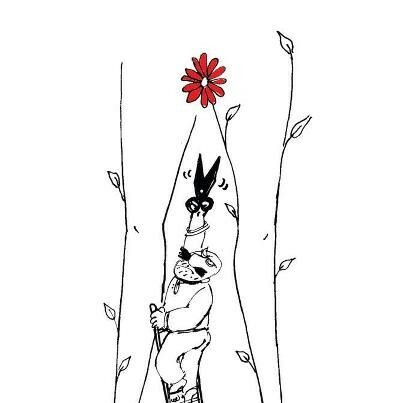 Most disturbing, yet thought-provoking, is one cartoon against female genital mutilation, in which a man is standing on a ladder between a woman’s legs, reaching up to cut her with a pair of scissors. Eladl complains that the new constitution does not guarantee women’s rights or respect the international treaties that protect women. It does not give rights to divorced women or guarantee equal rights for women workers. If the constitution is implemented, she fears women’s right will be turned back. Eladl’s critique of the post-Mubarak era goes way beyond the treatment of women. She says there has been little change in general because the new government is similar to the old, more concerned about holding onto power than making life better for the poor. 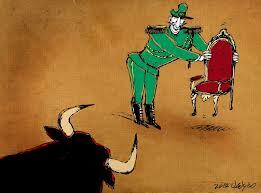 One drawing depicts the “new ruler” as a bull, fighting the military matador to get onto the king’s throne. 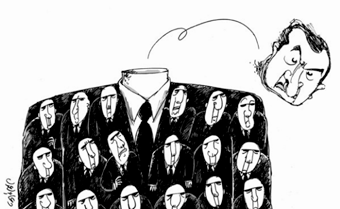 Another shows the head of Mubarak severed from his body, but his suit plastered with the faces of many more Mubaraks. Eladl is also disappointed in U.S. policy. Like millions in the Arab world, she had high hopes when Obama was first elected. “We were so hopeful when Obama came to Cairo with his beautiful speech, but then we saw that he continued to support repressive regimes, including here in Egypt, and that his words were hollow.” That’s why she drew a cartoon of Obama surrounded by a huge empty speech bubble. Another sketch shows Qaddhafi’s army shooting at civilians, while a big arm of America reaches out to grab a giant barrel of oil. 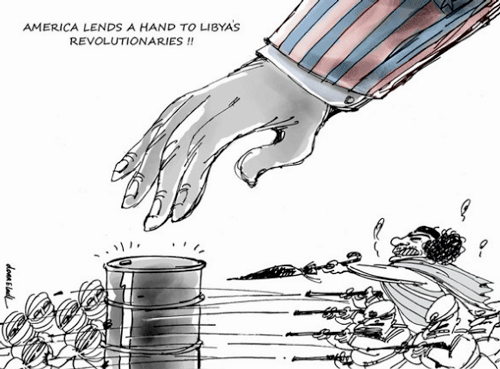 The caption says: “America lends a hand to Libyan revolutionaries.“ “I see the hypocrisy of U.S. policy, intervening in places like Iraq and Libya that have a lot of oil, but not in the case of Syria,” says Eladl. Medea Benjamin is cofounder of http://www.CODEPINK.org and http://www.GlobalExchange.org. Posted on April 1, 2013, in Feminism, North Africa and tagged anarcho-Islam, Arab Anarchists, Egypt, Egyptian Anarchists, Muslim Brotherhood, Salafists, Women's Rights. Bookmark the permalink. Leave a comment.